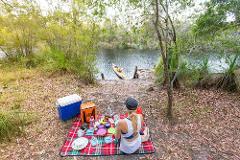 Explore the Noosa Everglades and Lake Cootharaba by sea kayak and camp within the Great Sandy National Park. Immerse yourself in the wilderness of the Noosa Everglades. Immerse yourself in the wilderness of the Noosa Everglades; kayak the twists and turns of the Noosa River, walk to the ancient Cooloola Sandpatch and camp in the bush beside the cool tannin waters of the Noosa Everglades. 2 Day Noosa Everglades Guided Kayak Tour - to book please contact us. Join one of our experienced tour guides on a journey into the pristine wilderness of the Noosa Everglades. Paddle and swim in the tannin coloured waters of the river and relax at your secluded bush campsite. Lead by one of our experienced tour guides, this trip is a must-do adventure experience! Explore the pristine Noosa Everglades by kayak, camp in a secluded bush camp beside the river and walk to the ancient Cooloola Sandpatch.